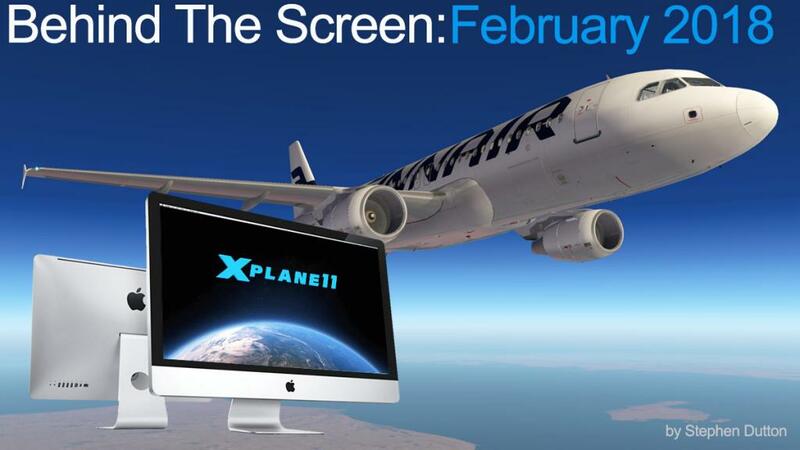 There is no doubt that X-Plane is powering its way into the year, already there is two months used up and there has been already so much come past our screens in announcements and releases. The big release was of course the FlightFactor A320 Ultimate and the ToLiSS A319 of which we will get to both in a moment. We are still most in X-Plane11 upgrade status as he developers keep on refining their past catalogue of aircraft to meet or mostly exceed the conditions and meet the requirements and features that X-Plane11 provides, so this last month you have seen a parade of the rich and famous to all vie for your attention. This includes the excellent Ddenn Challenger 300 Bus Jet, Pilatus PC12 HD Series XP11 by Carenado, Piper Twin Comanche PA30 v1.3 by vFlyteAir, Quest Kodiak v1.6 by Thranda and a zillion releases and updates from vSkyLabs. All excellent and all top notch aircraft to fill your skies. For me it was Airbus, Airbus and more Airbuses, in the FF A320 Ultimate, ToLiSS A319 and the beta release of JARDesigns Airbus A330v3. Same concept but different aircraft and almost daily, but in an interesting thing is in that one aircraft's performance and settings was useful on flying the other, you learnt something interesting on one Airbus system to find it useful on another, certainly between the FF A320U and ToLiSS's A319 and also the other way around. they don't compete with each other but more dovetail together depending on how you want to fly them on routes. The A319 is just perfect on some routes, and the FF A320U on others, and in most cases the choice can even come down to something like the sort of mood your in. The FlightFactor A320U release was actually a surprise? I thought at the last batch of beta purchasers it should have been released there and then as it was by and far mostly a complete simulation from block to block, but then FlightFactor started to do another round of bug fixing and tuning and doing daily updates and there was still a list there to work though, but mostly it was really new beta testers going over old ground, and I think the developers realised the same at the same time and released it... another factor was that the ToLiSS A319 went into RC status, so was FlightFactor just reacting and thinking that the A319 was going to have an imminent release and pull away a lot of sales? In reality it was far from the situation as there was at that point still ongoing work to be done, and the release came later as promised on the last day (even hour) of February. As you watched the final tuning of both these Airbus aircraft you could see they were going to clash or be released in a very short time of each other. My fears was the situation was that to have to put X-Plane users in a very difficult position on choosing which aircraft to purchase if your funds are limited. My position as a reviewer is always in this context, yes I do purchase aircraft and scenery, but more importantly every review is in that very important frame of you getting the best investment for your money. To a point I don't whip up cut and paste announcements on this site unless it is really important and everything that is listed or reviewed on X-PlaneReviews is seen in their right context on my computer and running in X-Plane. That means you don't get here everything that is published or announced. My feeling is that this site is a filter of what is the best and worthy of your attention and of course that important cost factor. But even this period early into the new year 2018 most of the releases have been very much in very high end cost factor. With FlyJSIm's amazing Boeing 737-200, the Ddenn's Challenger 300, Carenado's Pilatus PC12, the massive FlightFactor A320 Ultimate and now this A319 from ToLISS... it all and can be too much, were as in the past you usually had a significant major release spread out to mostly only two a year and we haven't finished yet with an update coming for JAR's A330 v3 and Aerobask's DA-64... all are more than worthy, and all are excellent high class aircraft... and your hard earned disposable income is not going to cover all of those bases. So all these brilliant aircraft are screaming "Buy Me!" and in your heart you are screaming as well, and I feel your pain I really do as these latest aircraft are really the best X-Plane has ever seen and it is not going to get any easier as more developers want to spread their wares to the simulator. And originally X-Plane was based on that more freeware and and share the love around basis, so has it all gone commercial. Can this huge change ruin the basis of the simulators core and is money replacing its heart and soul. A couple of developers vented their frustrations Support our Developers or prepare to say Goodbye! in noting the X-Plane payware market is too small to be viable. First point is that we can't debate that issue because we don't know who they actually are or what products they are are offering but they are noted as "big-name developers". I am first to admit that X-Plane was always a sort of hippy community of love and peace and paying almost for anything that was beyond their reasonable scope of thriftness. "Free" was always the first word that they expected and any commercial realism in that benefited them without reaching into any sort of pockets and never mind deep ones was always going to a priority. The downside of that mentality was that X-Plane's market stayed small and certainly was not as a viable business case, a few made pocket money to have a beer on a friday night or invested in a new joystick. It also hindered the simulator to what the dark side (FlightSimulator) was enjoying in bucket loads. The X-Plane market however did begin to stir a few years ago with the arrival of FlightFactor and JARDesign, but it was the brave coming over of Carenado that really changed the game. I have mentioned a billion times on this site of the failures of other FlightSimulator crossovers that failed to understand our market, but wanted to change it to their terms or make X-Plane the FlightSimulator Mk2 in their names because at that time FlightSimulator was a dead duck left by the side of the road. To its credit X-Plane stayed true to its form and rightly so. So yes the cash didn't flow to their coffers in bucket loads because in reality they tried to bamboozle X-Plane users with easily converted FlightSimulator crap, there is one thing that you don't do is take X-Plane users for granted or even as a bunch of airheads, if anything we are really far more smart and intelligent than that. Carenado was brave to try to understand and actually see the potential of our market, but smart enough to understand that X-Plane has to be and use X-Plane features and not be FS MK2. They found the most brilliant X-Plane developer and basically gave him an offer he couldn't refuse, and results is that I will bet my house that not one of the developers noted in that article is from Carenado. But what about the X-Plane market? Well the sheer volume of the above releases say developers are willing to develop for X-Plane and give us quality products. The point is that X-Plane users have light pockets and FlightSimulator pockets are deep is not going to wash with me, the point is that all simulation users all have the same sized pockets, the difference is in the actual market size. There is no doubt that the release of X-Plane11 will be seen as a total watershed moment for the simulator. New users and FlightSimulator users are finding that out and want in... X-Plane in the last twelve months added 100,000 users to its base in twelve months, more than the last three years put together, go through the forums and they are certainly liking what they are seeing and using. To a point X-Plane is still a small market compared to the mega FlightSimulator market, but that is changing and very quickly. The problem for the developers noted is that X-Plane is in that major transition period and a bit like Apple before they released the iPhone, they were an innovative company but "hey" their Mac market share is nominal compared to Microsoft... and today? When people see a great thing they will want it. The real issue for developers is quality, X-Plane is now very demanding of quality and features. Once a developer could get away with a very good product, but as I note through review after review that the quality and features are going through the roof but users will pay for that quality if it delivers, and the really heartbreaking part of my job is seeing great past developers and friends being left behind as their work is just not going to cut it anymore, once brilliant but now their ideas and skills are simply of another era. It has always been the "Chicken or the Egg" situation for X-Plane and that hasn't changed at all and the developers are stuck right in the middle of that, but the reality is that to make money you have to deliver high quality product, even change your way of thinking in that you may have to collaborate to cover the quality and detail that is now required, because that is what this developing business now is a "business" and not a hobby, but as they say "If you build it they will come" and that rings true here as well, the more the developer deliver then the bigger the market they have to sell to, but also another major factor is still that X-Plane clubby mentality... we develop and stay within the X-Plane universe and hope to sell to that small market..
God that was a big busy month... see you next month at Easter. 3. I wasn't sure about the quality of "quality products" of X-Plane. 1. X-Plane does not need other simulator's developers and their "dirty" (yes I am sorry but it is!) business models, if they want to have the business model here. FF and then TOLISS proved that X-Plane developers can produce as good if not better products. 2. X-Plane community is small simply because a) There are not enough quality products and to a lesser extent b ) transition period is sometimes really frustrating (in terms of understanding X-Plane and UI) I moved because I saw I was wrong to think X-Plane does not offer an Airbus as good as other platform's Airbus (the one that you pay to get a malware on your computer). That would be great for X-Plane. 1. Filling the gap in quality: a good short to medium haul Airbus (done), a good medium to long distance Airbus and their Boeing counterparts, (I wish TOLISS was working on a Boeing rather than Airbus or at least on a 330 not 319) Yes these are important. We have to admit most people are flying on these airplanes, especially younger ones and as far as I noticed X-Plane community is younger than other simulator's. Yeah ok, you have to learn it step by step, aviation is about enthusiasm and this and that...I don't deny any of these but what I have seen and experienced by now in flight-simming community, a release for a quality Boeing or Airbus is huge news. Just have these 4 planes and then people will come. Then their needs for other types of aircraft will run the market anyway. 2. Good weather engine (and may be camera?) software. I have been reading about the currently available ones and I am yet to be convinced that they are as good as that of other platform's. May be I am wrong but in that case go ahead to step 3. 3. Promote the products and do it better! I have been receiving X-Plane newsletters and I know VMAX/FF also has a 777 and there is also a very good Zibo Mod for default 737. I just dont know how good they are. People in other simulator can only dream about an EFB (yeah upcoming 747-8 will have it I know) in a cockpit and there is a great EFB on FF A320. Google maps and a browser where you can see the charts?? Wouw! I really believe 90% of flightsim community dont know about it.